Agriculture: Agriculture is the science and art of cultivating plants and livestock. 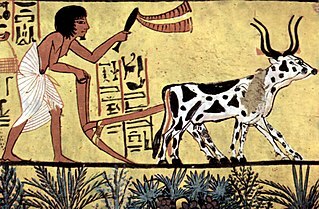 Agriculture was the key development in the rise of sedentary human civilization, whereby farming of domesticated species created food surpluses that enabled people to live in cities. Agriculture in India: The history of Agriculture in India dates back to Indus Valley Civilization Era and even before that in some parts of Southern India. India ranks second worldwide in farm outputs. Agrippina the Younger: Agrippina the Younger , also referred to as Agrippina Minor (Minor, which is Latin for "the Younger") was a Roman empress and one of the more prominent women in the Julio-Claudian dynasty. Her father was Germanicus, a popular general and one-time heir apparent to the Roman Empire under Tiberius; and her mother was Agrippina the Elder, a granddaughter of the first Roman emperor Augustus. Agriculture in China: Agriculture is a vital industry in China, employing over 300 million farmers. China ranks first in worldwide farm output, primarily producing rice, wheat, potatoes, tomato, sorghum, peanuts, tea, millet, barley, cotton, oilseed and soybeans.